‘Do you fancy a coffee?’ – it’s a question asked umpteen millions of times the world over, day in, day out. It’s one of the most common social pleasantries on the planet and it covers a multitude of motives; it could be work related, catching up with a colleague, chatting with a friend, the first tentative steps to establishing a personal relationship, be it a whirlwind fling or a lasting romance. In the way that we, somewhat ridiculously, think that making a cup of tea in a crisis situation will makes things ‘better’, having a cup of coffee always seems that little bit more exotic and stimulating – irrespective of caffeine levels. There’s so many from which to choose, Americano, Cappuccino, Espresso, Macchiato…there’s even some that don’t sound as if they should be playing for Juventus, Napoli or AC Milan such as a skinny latte, Mocha and a flat white! The Italian references are not just a forlorn attempt at frivolity – all will be revealed shortly. Caressing your senses, the rich aroma of coffee and the explosion of taste is one of life’s less heralded ‘highs’, but try to imagine the impact it might have on an individual who is denied the company of a business associate, an acquaintance, a friend, a lover or a lifelong partner. Coffee is an invaluable pawn in modern day social etiquettes, now it’s poised to be a symbol of man’s humanity to his fellow man in times of need. 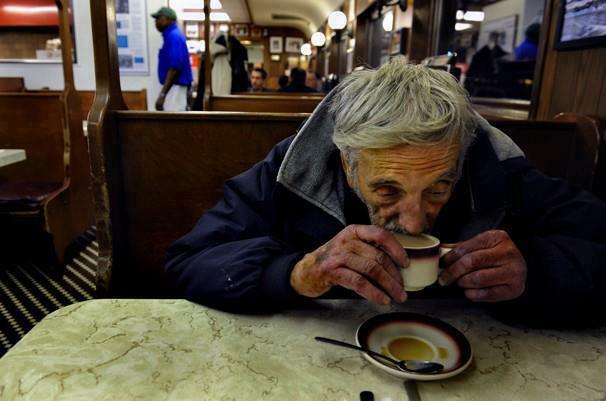 A humanitarian ‘movement’ called Suspended Coffees has embraced a social nicety born from Naples prior to the First World War, and turned it into a rapidly growing 21st century global phenomenon. It’s an unlikely, but nonetheless, touching tale, of one man’s vision to make a hostile and often inhospitable world a friendlier more welcoming place. Coffee drinking is almost a religion in Italy and the Neapolitans led the way in establishing a tradition called ‘Caffee Sopresso’ – suspended coffee. Legend has it that if good fortune favoured a citizen of Naples, the individual would mark the occasion by purchasing a celebratory coffee for themselves and buying an extra cup which was suspended for someone less fortunate. 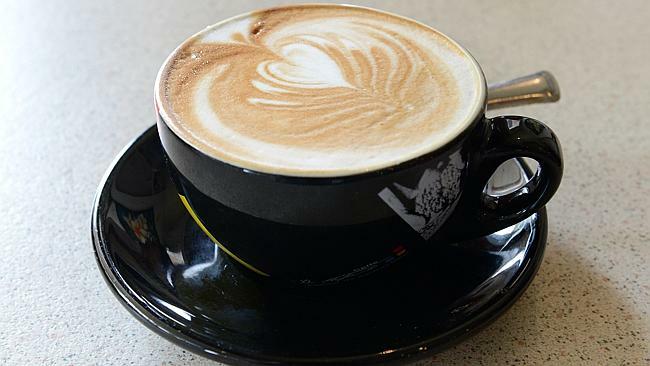 The ‘Barista’ – the bar or coffee shop owner – would keep a log of any extra paid-for coffees and, if, as and when, an individual who was down on their luck enquired about a suspended coffee, a cup was duly served and chalked off the ledger. As a national tradition ‘Caffee Sopresso’ continued through the war ravaged, recession-hit early 1900s all the way through the 2nd World War. It waned in the wake of Mussolini’s downfall and the years of austerity that followed. 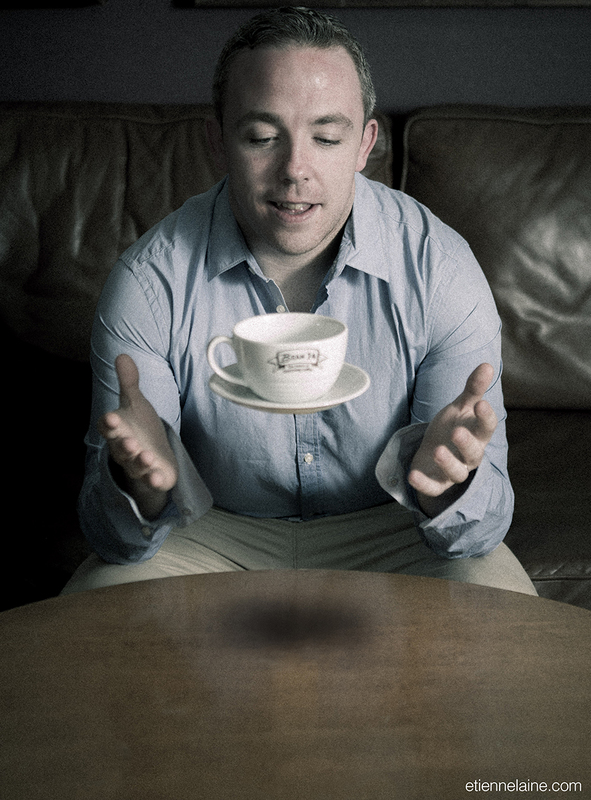 Now, John Sweeney, a 29-year old, father-of-four from Cork, has bridged a divide spanning decades, grinding out the hard yards in resurrecting the ethos of Suspended Coffees, ensuring it percolates through to a worldwide audience. A plumber by trade, John, suffered an industrial injury, and consequently has been unable to hold down regular paid work. Notwithstanding the stresses of having to provide for wife Erin and children Josh, Chloe, Jasmin and Alex, John came across the origin of Suspended Coffees and, in his own words was ‘blown away’. Having lost his job, John found himself looking at the world from a different perspective and his burning passion to make it a better place came to the fore. 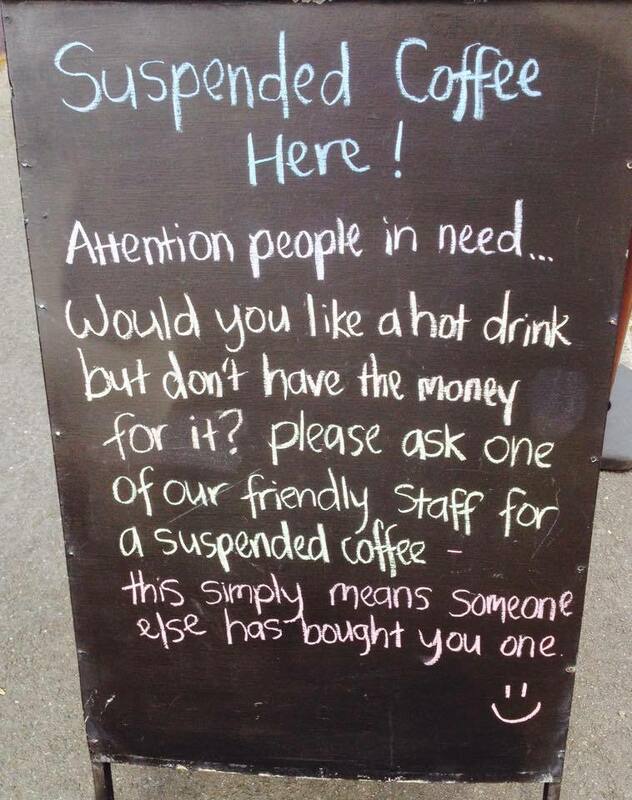 “I started up a Suspended Coffees page on Facebook and set about trying to find stories of human kindness, ones in keeping with the ethos of Suspended Coffees. Now nearly eight months on, John has a Facebook account that has attracted more than 137,000 ‘likes’ from people, all willing to embrace the act of giving freely for the benefit of others. It’s a rapid and remarkable rise to prominence for the likeable Irishman who simply wants to make the world a nicer place. 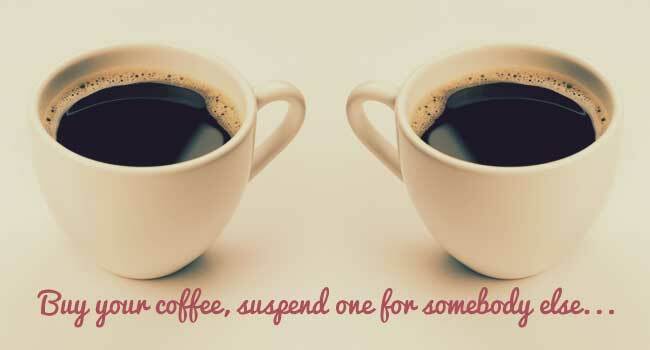 John’s aspirations for Suspended Coffees are wholly altruistic – totally in keeping with his motivations from the outset. He is nonetheless keen and ambitious to see the ‘movement’ gain momentum across the face of the earth. The ‘we’ refers to an unlikely Trans-Atlantic alliance, one where John has teamed up with a kindred spirit in the shape of Lauren Soponis from Wilmington, North Carolina. Lauren looks after the ‘administrative’ side of the Suspended Coffee activities, overseeing social media activities and offering support and a ‘sounding board’ for John’s natural enthusiasm. John has generated active contact with literally thousands of coffee outlets, all willing to grasp this laudable baton of non-traceable charity. 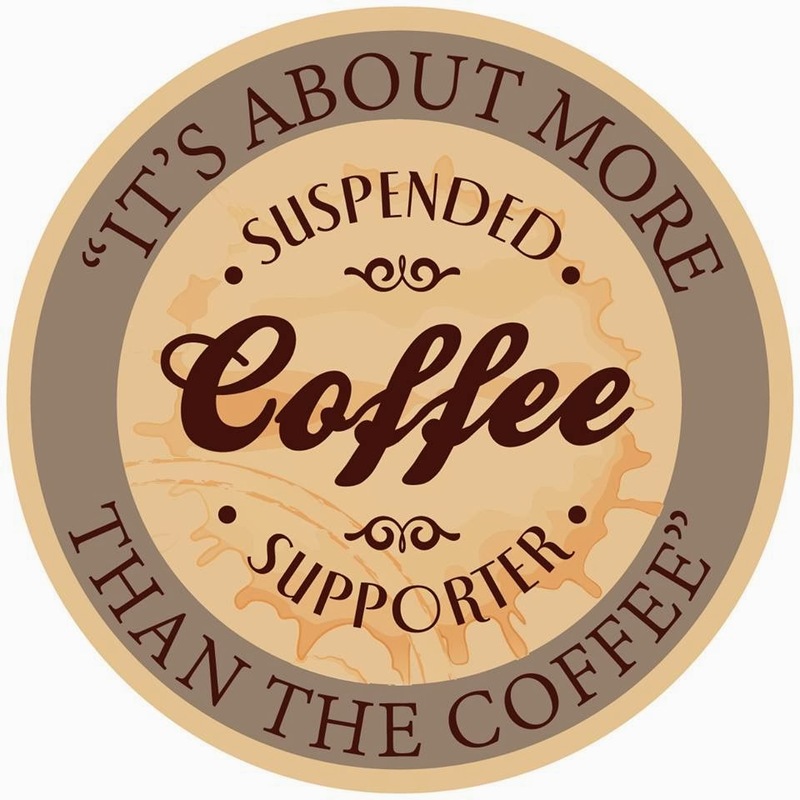 Coffee shops, bars and diners from Australia to the USA and throughout Europe are now actively advertising that they are willing participants, advocates and partners of Suspended Coffees. It’s a simplistic approach in a world too often driven by self interest and making profits, one where the rich get richer and the poor can fend for themselves. John Sweeney is the real deal – a man who is happy to be the catalyst for a wave of human kindness – a tsunami of selfless acts that not only help those in need, but help shape the thinking of those able to give freely, without any requirement for adoration. His dream is to have Suspended Coffees outlets around the world and to establish the movement as a formal charity or a not-for-profit organisation. He cites the example of another ‘John’ a certain mega rock star by the name of Jon Bon Jovi, who has a ‘JBJ Soul Kitchen’ in New York. Styled as a ‘community restaurant’, diners pay for meals with a minimum donation or, if they can’t afford to pay, they undertake voluntary community work. It’s a blueprint that works http://www.jbjsoulkitchen.org/about and one that John is keen to emulate. Self explanatory – the logo says it all! John wants to make the movement his life’s work and maybe, just maybe, there are like minded philanthropists with the know-how and business acumen to help him make it a reality so he’s not left just ‘Living on a Prayer’. The man from Cork has opened up something special – something that could grow and grow for the benefit of tens, if not hundreds of thousands of men and women, who find themselves in need of a pick me-up. An appreciation of what lies behind that warming ‘cuppa’ could be the difference between retaining or losing faith in human kindness. Let’s all ‘pay it forward’ – it’s a small price for a potentially massive return.